2018 proved a challenging year for BikeNewark, as a number of issues began to compete for our attention. Though we know that there is so much more work ahead, there were a lot of things we accomplished last year with our partners’ support. Let’s take a look at what we did. consulting with and providing input to Johnson, Mirmiran & Thompson on the Delaware Avenue two-way protected bike-lane project. several members attending a series of UD-led Newark Futures workshops. presence on behalf of the bicycling community at various City Council and city Traffic Committee meetings. submitted LAB Bicycle Friendly Community application on behalf of the City of Newark. Newark received its third consecutive bronze-level designation, this time for 2018-2022.
submitted Places for Bikes application on behalf of the City of Newark. According to the data gathered by People For Bikes, Newark ranked 39th overall nationwide and 7th among cities with a population of 100,000 or less in terms of bikeability. the annual Bike to Work Day on University of Delaware campus on May 21 (successfully rescheduled due to poor weather). Keynote speaker was New Castle County Executive Matt Meyer. More than 70 participants came to the event, which was supported by 6 corporate sponsors. During the event, the annual Bicycle Friendly Community Leader Award was presented, and a Trek hybrid bicycle was given out as a random prize. nine First Friday Rides (January and March events were cancelled due to poor weather). These social slow rides through Newark averaged about 25 participants. two Newark Historical Buildings Bicycle Tours in the fall, in cooperation with Newark Bike Project. Each event drew between 10-20 participants. 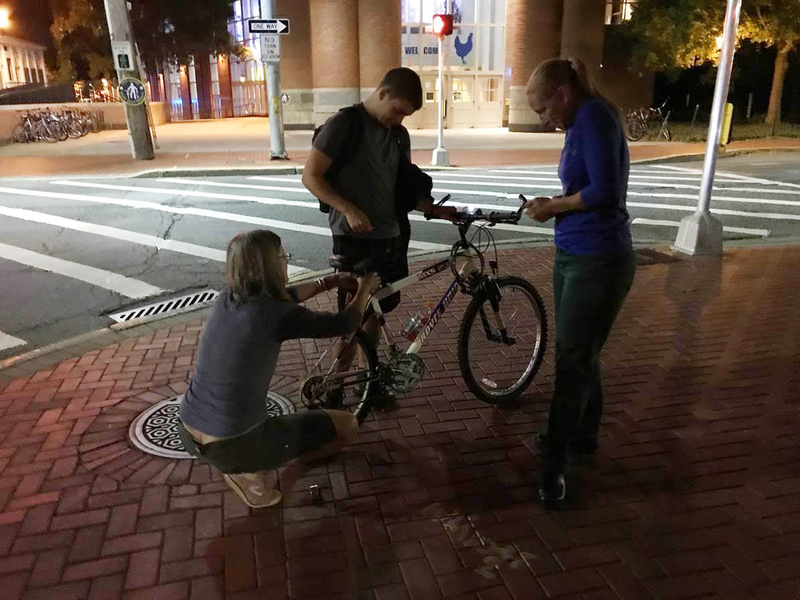 a Bike Lights Night event on October 25 at the corner of North College Avenue and Main Street, during which 25 sets of lights, courtesy of UD, were installed free of charge. Spring event, during which 10 sets of bike lights were installed free of charge. August 25, in coordination with UD’s 1743 Welcome Days, during which 6 sets of lights were installed free of charge. September 12, during which 20 sets of lights were installed and 6 helmets were given out free of charge. October 25, during which about 20 sets of lights were installed free of charge. two BikeNewark Community Nights—June 21 at Handloff Park and October 26 at Wooden Wheels, attended by 31 and 50 participants, respectively. the annual Mayor’s Fun Ride on June 2, which was a big success in terms of funding raised for bicycle-related projects. distributing bike-safety flyers in four languages—English, Spanish, Chinese, and French—to the English Language Institute. 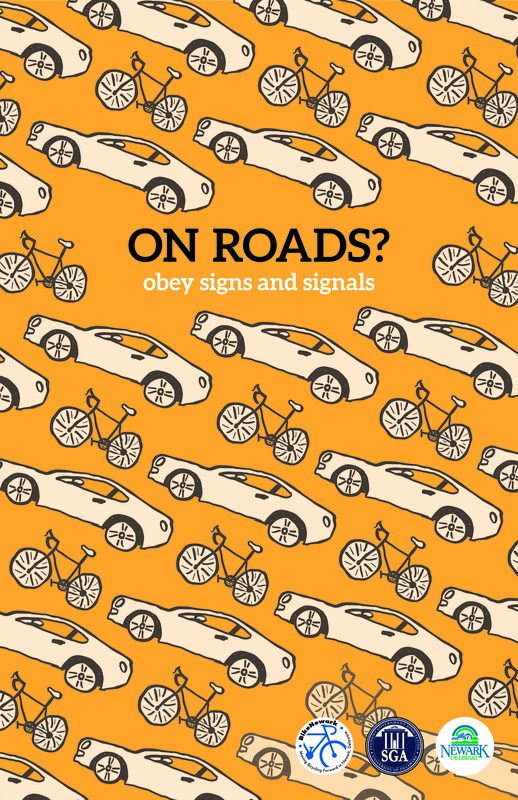 These were based on the “4 Safety Tips for Bicyclists” cards that were printed in January 2018 for use by partner organizations. executing and posting results of a City Council candidates survey in advance of the April municipal election. volunteering at the Walkable/Bikeable Delaware Summit in May, which was organized by Bike Delaware, one of BikeNewark’s partners. hosting an information table during Newark Community Day (September 16). 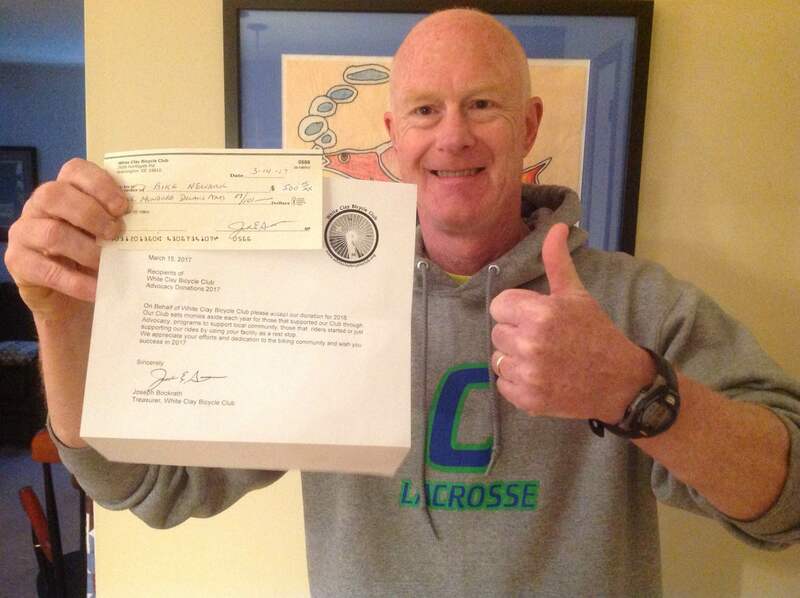 Thanks in large part to the efforts of our ad hoc organizational committee and a generous grant from the White Clay Bicycle Club, the partnership formerly known as the Newark Bicycle Committee became BikeNewark—a Delaware nonprofit corporation dedicated to local bicycle advocacy. BikeNewark.org was launched, as were our Facebook and Twitter accounts. Participated on engineering-related committee with regard to the Delaware Avenue two-way protected bikeway project (a.k.a. “cycletrack”), scheduled for completion by summer 2019. Advocated for green-backed sharrows to be added on both lanes of Main Street between the Pomeroy Trail and the Deer Park as part of the Main Street pave and rehab project, scheduled for completion sometime in 2019. Supported recommendations of the Cleveland Avenue improvements Task Force before City Council, which it unanimously voted to approve on Aug. 14; scheduled for completion by 2021. A parking restriction and pedestrian scramble have already been implemented. In conjunction with DelDOT, WILMAPCO, Newark Bike Project, and UD, we held several bike safety–related events primarily aimed at students (“Bike Central” and “Bike Lights on Demand”), during which bike lights were installed, bikes registered, and safety information distributed. Successfully executed a bicycle “civility” campaign with message posters designed by UD design students and co-organized UD Bike Days with the UD Student Government Association in cooperation with the City of Newark. Helped organize the third annual Mayor’s Fun Ride and Newark’s annual Bike to Work Day event, both held in May each year. Helped organize Bike to School Week at John R. Downes Elementary School, including a pop-up buffered bike lane demonstration, bike trains on the initial day, and a user-experience survey. Also involved in discussions related to the school’s Safe Routes to School grant. Worked with DelDOT and the City of Newark to initiate a trial contraflow lane and related infrastructure on Main Street between North College Avenue and South College Avenue. Produced an educational video (see below) and related educational flyer showing how to properly use this new amenity. Performed post-installation data gathering. With help from a new citizens’ group and the City of Newark, co-organized the implementation of a two-week pop-up mini-circle demonstration at the intersection of Orchard Road and Winslow Road to help show the positive effects of slowing while not stopping traffic at this and similar intersections. Supported two of the City’s Department of Parks & Recreation projects at City Council—2018 completion of the “Pomeroy Connector” trail between Creek Road and Fairfield Crest and the longer-range bike-ped Charlie Emerson Bridge to be built over White Clay Creek. Organized monthly First Friday Rides in downtown Newark to combine the encouragement of bicycling downtown (especially on Main Street) with a social agenda. Co-organized a Newark Historical Buildings Bike Tour with the Newark Bike Project. 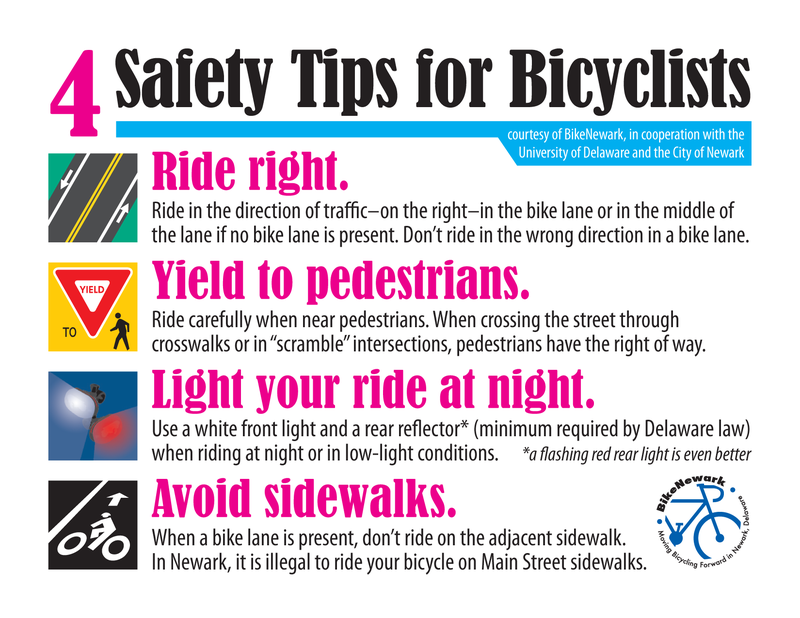 Partnered with UD Police Department to design safety cards for bicyclists and pedestrians. On behalf of the City of Newark, began working on Bicycle Friendly Community application to the League of American Bicyclists. The goal is for Newark to become the first city in the state to achieve “Silver” status. We look ahead to 2018 and working toward achieving our stated goals as well as continuing with many of the above-noted activities. Want to help support BikeNewark? Get involved or support our efforts monetarily. The City of Newark has a new feature on East Main Street for bicyclists—a pocket contraflow bike lane. Unique in Delaware, this trial project was a result of a partnership among BikeNewark, the City of Newark, the University of Delaware (UD), and the Delaware Department of Transportation (DelDOT). DelDOT completed the work of striping and signing this contraflow lane in July, and, now that UD students are back on campus, the lane will get its first big test. BikeNewark created an educational video and a one-page flyer to help show how this contraflow bike lane can be used safely and legally. BikeNewark will be evaluating the success of this trial project, which will run through the 2017-18 academic year. We often feel we don’t get to directly affect decisions that are made in our society. On Monday, March 6, though, there is an important opportunity to do just that with regard to improving conditions for bicycling. This public meeting will take place on Monday, March 6, at 7 p.m. at the Newark Senior Center, off Marrows Road. 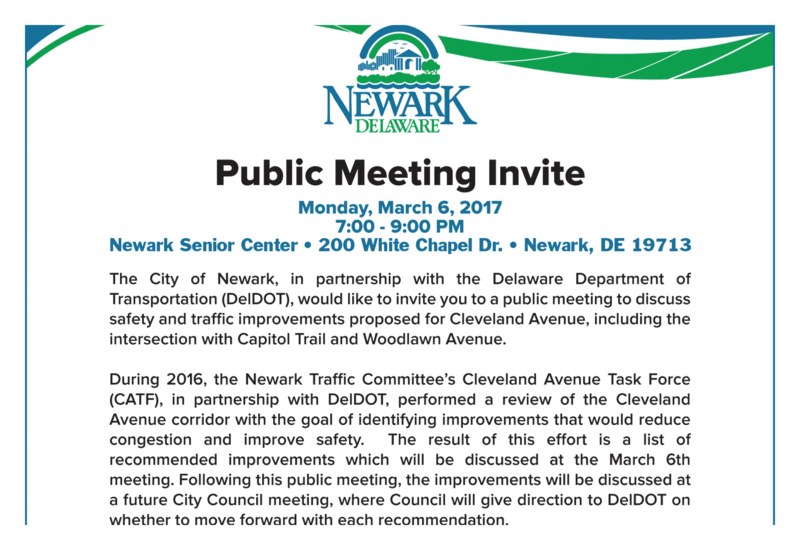 This meeting will be the final chance for the bicycling community to vocally support the recommendations made by the Cleveland Avenue Improvements Task Force before City Council deliberates, votes, and forwards its wishes to DelDOT ahead of DelDOT’s pave and rehab work along the length of this busy east-west corridor. In addition to the task force recommendations, DelDOT’s suggestion of implementing a “Florida-T” configuration at the intersection of Cleveland Ave. and Kirkwood Highway will also be discussed. BikeNewark is in favor of this use of the Florida-T and each of the recommended improvements along Cleveland Avenue. In addition to the aforementioned meeting, initial meetings were held recently regarding bicycling in Delaware. Four statewide public-input sessions have already occurred in advance of the initial drafting of a statewide bicycle policy document—the Delaware Bicycle Plan. This past fall, the City of Newark, with assistance from BikeNewark, applied for an ambitious new program offered by PeopleForBikes—The Big Jump project. The Big Jump is a strategic three-year effort to help show that quickly connecting good bicycle networks and encouraging use can result in a big jump in bicycling, even doubling or tripling the number of trips. Newark was one of 80 cities nationwide that applied with the hope of being one of the ten cities to benefit from The Big Jump project. While we’re disappointed that Newark wasn’t selected, BikeNewark still looks forward to working with interested bicyclists and partner organizations to see expanded bicycling facilities and programs that result in less congestion and air pollution, greater comfort and safety, and enhanced health and economy. Want to share innovative ideas for expanding our bicycling network? Do you have artistic, social media, or marketing skills to help market more and safer cycling to our community? Would you enjoy building some demonstrations to show how neighborhood bikeways might function? Like to organize rides? We encourage you to get involved with BikeNewark, joining one of our subcommittees or helping with events. Get involved with BikeNewark and help us fulfill our mission of improving bicycling in Newark. Take this quick survey and let us know how you’d like us to best keep in touch with you and how you’d like to help us. If you have a comment, suggestion, or question, please contact us. Biking is great exercise, reduces traffic, saves money, builds community, protects the environment, connects you to place, and feels good!